Celebrate the place it all began with this personalized line drawing of a meaningful spot. Celebrate both a couple's love and the place that started it all with Sandrine Froehle's stylish print. 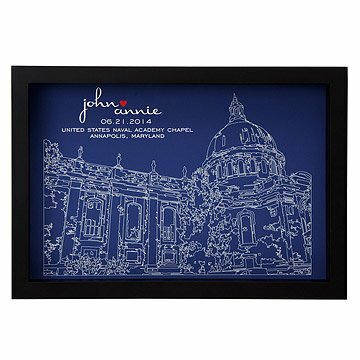 From the place you met to the place you were wed, simply send in a photo of a meaningful building facade or special location and a beautiful line drawing is produced with the partners' names, wedding date, and city. Frame made in China. Printed in Oregon. Check out our original : Skyline of Love. 13.5" H x 19.5" W x 2" D.
Comes ready to hang in a black shadowbox frame. Hardware not included. This is a beautiful piece. I love it and am looking forward to giving it to my sister. The only down side is that the frame feels a bit "flimsy". That said, I would not hesitate to purchase it again, however. This was one of my favorite finds so far on uncommongoods! The seller was very easy to work with, ensuring the print was exactly what I envisioned. The seller was quick to respond to emails when setting up the print and then sent me a proof in a couple of days. My fiance and I both love the picture- she truly captured the exact place where he proposed from a few pictures I sent and minimal instruction. We could not be happier with it! This product was delivered very quickly and is so cool. The ordering process was super easy - just upload a photograph of the church or ceremony venue and add the other information - bride and groom's names, name of building and its location, and wedding date. You will be able to view the layout before approving it. I photographed the setting where my daughter's wedding will be held. I received the proof via email within a few days. We did a few minor changes and it was shipped promptly. It was well protected with double cartons and tons of bubble wrap. My daughter and her fiance were really touched and very excited to have this special memento of their wedding, especially since they live out of town. I was even able to use her wedding colors for the heart and background. Able to document location and date of wedding. Not able to add the place because it was not in the picture that was scanned. But was able to make changes quickly and efficiently and arrived sooner than expected. Working from a digital photo that I sent via e-mail, the artist prepared a drawing of the gazebo in which my wife and I were married. The proof arrived within a couple days, and I suggested a minor alteration. A revised proof arrived the next day. The entire process took less than a week. The framed picture, which arrived shortly thereafter, was all that I had hoped for. Can't wait to give it to my wife on our wedding anniversary.